Issues addressed: Physical activity recommendations for adults worldwide advise participation in moderate-intensity physical activity, such as walking, on most days of the week. Younger adults report the lowest prevalence of walking. 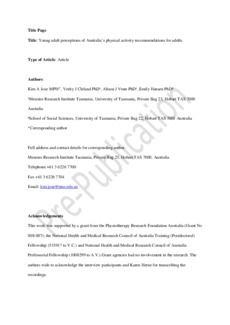 This mixed-methods study explores the salience of Australia's activity recommendations around moderate-intensity physical activity, particularly walking, for young Australian adults. Methods: Semistructured interviews were conducted with 24 young Australians aged 17-25 years. During interviews, Australia's physical activity recommendations for adults were explained to participants, highlighting the inclusion of moderate-intensity physical activity such as walking. Participants were asked to comment on the recommendations and walking for physical activity and exercise. Data from interviews underwent an iterative thematic form of analysis. Participants also completed the International Physical Activity Questionnaire (IPAQ) and were asked to complete a pedometer diary. Results: No participant was classified as sedentary; twenty three participants reported walking for transport and nine for leisure (IPAQ). During interviews, the majority of participants (n=20) did not identify walking as physical activity or exercise. Participants focussed on the cardiorespiratory (fitness) benefits associated with physical activity and believed walking was of insufficient intensity to achieve these benefits at their age. Conclusions: Walking was considered an everyday activity and of insufficient intensity to achieve any health or fitness benefits. So what? The belief that only vigorous physical activity conveys any fitness benefits may act as a barrier to participation in moderate-intensity physical activity such as walking, particularly among sedentary young people. © 2013 Australian Health Promotion Association.